Wheezing and shortness of breath are common mold health issues. Exposure to household mold, especially strains of mold like Stachybotrys chartarum, often referred to as black mold or toxic mold, is associated with multiple health problems, some of them quite serious. Mold-related health issues include allergic reactions, skin rashes, hives, headaches, migraines, coughing, sneezing, difficulty breathing, eye irritation, sore throats, sinus infections, bronchitis, pneumonia and pulmonary hemorrhage (bleeding in the lungs). Symptoms can range in severity from mild to severe, even life-threatening. Why Does Exposure to Mold Cause Wheezing? Microscopic mold spores float in the air, where they can easily be inhaled. Inhalation of mold spores can irritate the sensitive linings of the throat, bronchial tubes and lungs. 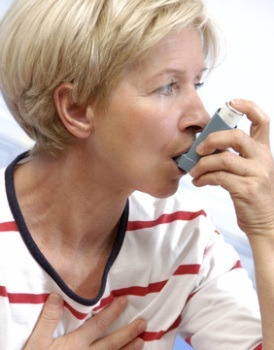 Inflammation of the throat, bronchial tubes and lungs then restricts airflow, which in turn can make you wheeze. Inhalation of mold spores can also lead to infections in the sinuses, bronchial tubes and lungs, which may increase production of mucous and other secretions, which further limits airflow and increases the sound of wheezing. It’s important to understand that when someone wheezes, it doesn’t just produce an odd sound. It typically indicates difficulty getting sufficient air and a feeling of being unable to breathe freely. It can be very uncomfortable and even frightening. Why Does Exposure to Mold Cause Shortness of Breath? As described above, inhalation of mold spores irritates and inflames the delicate linings of the throat, airways and lungs, causing swelling and restricting airflow. It can also lead to the development of infections like sinusitis, bronchitis and pneumonia, making breathing more difficult. It can also trigger asthma attacks in people with asthma and the development of asthma-like symptoms in people not previously diagnosed with the condition. In some cases, shortness of breath is merely uncomfortable, but in other cases, a person’s oxygen level can drop dangerously low. It can become life-threatening. If you’re experiencing symptoms of mold health issues, or think your symptoms might be caused by exposure to mold, see your doctor. Make sure you tell your doctor if you’ve been exposed to mold or think your symptoms, including wheezing, might be mold-related. Your doctor may order some tests, such as blood tests or x-rays, to help diagnose the cause of your symptoms. Your doctor will prescribe treatment for your condition, but it’s important to understand that if you continue to be exposed to mold, you’ll probably continue to experience symptoms and they may even get worse, even with treatment. In order to make a full recovery, you’ll need to have all mold thoroughly removed from your home. Of course, we recommend everyone with mold in the home remove it, or have it removed, as soon as possible in order to prevent the development of mold-related health issues. If you’re already experiencing symptoms that are or might be related to mold exposure, though, it’s especially important that you take care of mold removal as soon as possible. While some homeowners prefer to handle mold removal on their own, that may be inadvisable if you’re having mold-related health problems, even if you have the knowledge and the skills to do the job. The process of removing mold will expose you to more mold spores, which can worsen your symptoms. Talk to your doctor if you’re not sure if it’s safe for you to handle mold removal on your own. We suggest scheduling an appointment for a free consultation and inspection with a mold remediation professional. He or she will visit your home, inspect for mold, discuss the extent of the problem with you, and offer advice regarding the cleanup process. There is no cost and no obligation, and you’ll benefit from some free professional advice even if you decide to handle the cleanup on your own. To find qualified mold remediation professionals offering free consultations and inspections in your area, follow the link.